Dimensions: W.42 cm | D.36 cm | H.77 cm Materials: beech frame Colors: bleached, dusty cocoa, tin grey or lacquered natural ash. 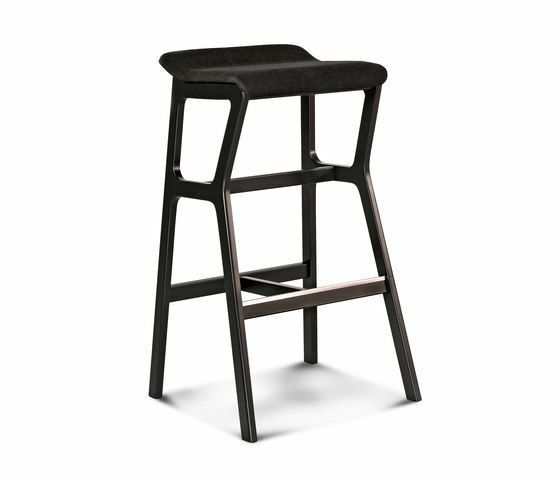 An asymmetrical design is seen on a stool that almost seems to dance, move, and encourage socialising and sharing. Its new version offers an upholstered seat, available in fabric or synthetic leather. Nhino, available in three different heights of 77, 67 and 47 cm, is perfect for use around the kitchen table for breakfast, in the dining room for lunch or in the living room for tea and coffee. It is also a versatile chair for contract furnishing. It is especially suited for rooms with an informal style, like a lounge bar or fast food restaurant. Its tallest version is perfect next to the bar for appetizers. The structure is made of beech wood with rounded edges, while the seat is in beech plywood. For the finish, the wood can be bleached or painted in natural tones such as cocoa and tin gray, or painted in bright colours like red, yellow or orange and many others.